Although its prospects in the region are likely limited, IS could bring further death and destruction to South Asia. The group that describes itself as the Islamic State (IS, also known as ISIS or ISIL) has formally entered the fray in South Asia, recently announcing the formation of a wilayah (province) in the region. IS is positioning itself as a competitor to the Afghan Taliban and al-Qaeda in South Asia. It is unlikely to supplant the two groups. Still, the establishment of a wilayah in the region raises the risk of an increase in sectarian attacks not just against Shias in Pakistan and Afghanistan, but also against fellow Sunnis. It may also complicate the Kabul government’s efforts at reconciliation with the Afghan Taliban and give IS an opportunity to use the region to attack Shia Iran. On January 26, Abu Muhammad al-Adnani, the IS spokesman, officially recognized the wilayah of Khurasan – a region that encompasses Afghanistan, much (if not all) of Pakistan, and parts of neighboring countries. IS commanders in Khurasan control little terrain, and so the wilyah is more notional than physical. But, importantly, IS has formed a single group operating on both sides of the Durand Line. In contrast, al-Qaeda has largely worked through Taliban groups operating separately in Afghanistan and Pakistan. IS has yet to identify the boundaries of Khurasan, and so it’s unclear whether this wilayah includes all of Pakistan, or whether the provinces of Punjab and Sindh fall outside of its orbit. The recognition of the Khurasan wilayah comes after many entreaties to Abu Bakr al-Baghdadi, the IS leader, made over the past year and a half by disgruntled Taliban commanders in Afghanistan and Pakistan. The former Pakistani Taliban spokesman, Sheikh Maqbool, made at least five pledges of allegiance to al-Baghdadi from 2013 into this year. Finally, last week, IS accepted the pledges made by Maqbool and other former Pakistani and Afghan Taliban commanders, stating that they have “fulfilled the conditions and met the requirements” for the establishment of a wilayah. What those conditions and requirements exactly are is unclear. 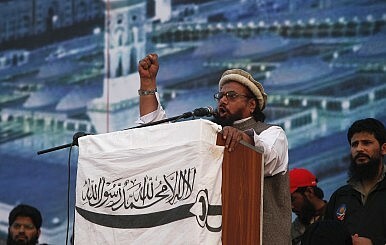 At the helm of IS in Khurasan is Hafiz Saeed Khan, the former leader of the main Pakistani Taliban faction in the Kurram Agency of Pakistan’s Federally Administered Tribal Areas (FATA). Hafiz Saeed and several other commanders in the group come from tribal areas and districts that have featured sectarian violence between militants from the Sunni Deobandi subsect and Shias. Sectarian violence will undoubtedly be a key component of IS operations in Pakistan and Afghanistan. And there are indications it won’t simply be directed at the Shia. IS spokesman al-Adnani called on commanders in Khurasan – whom he described as “muwahhideen” or monotheists – to join “a new fight” to “enforce tawhid (monotheism) and vanquish shirk (polytheism).” It is a call to violently “purify” Islam in this heterogeneous, but Sunni Muslim-majority region. And so we should not be surprised if IS militants attack Sunni Sufi shrines and mosques in addition to targeting the Shia. Like the attacks on the Shia, there is precedent for Sunni jihadists targeting Sunni Sufis in Pakistan. As the Pakistani Taliban spread across Pakistan’s Pashtun belt beginning in 2007, it attacked Sufi shrines generally associated with Sunnis. But eventually the pace of these attacks slowed due to opposition from the general public and perhaps even al-Qaeda. IS commanders could also target other jihadist groups, including al-Qaeda. In recent weeks, the group has come close to engaging in takfir (excommunication) of al-Qaeda’s central leadership. A former al-Qaeda member writing in the January edition of IS’s flagship publication Dabiq excoriates non-Salafi militants in Pakistan’s tribal areas and lambasts al-Qaeda for its compromises with them. [Since the 1990s, the Salafi al-Qaeda has been allied with militants from the Sunni Deobandi subsect predominant in Pakistan and Afghanistan.] The aforementioned IS writer condemned the top figures in al-Qaeda’s new South Asia affiliate for being “Sufis.” And Mullah Omar, the Afghan Taliban leader and a Deobandi, is viewed by IS as discredited, having allegedly made grave errors in religion. Al-Qaeda owes its rise and resilience in South Asia to its pragmatic association with Sunni Deobandi jihadist groups and clerics such as the Afghan Taliban. In contrast, for IS, ideological purity – the adoption of Salafism – is a prerequisite for association. For this reason alone, IS is unlikely to establish a widespread foothold in South Asia, where Salafism has limited appeal and most militant groups are Deobandi. IS’s prospects in South Asia will be further constrained by the governments of Pakistan and Afghanistan, which are keen to ensure that the group will die in its infancy. They have arrested a few militants they claim are affiliated with the group. IS has also factored into their bilateral discussions with U.S. officials. If it can avoid direct confrontation with fellow Sunnis in its formative period in Khurasan, IS may have an opportunity to position itself as an anchor for outlier jihadist groups in the region – especially if the Afghan Taliban moves toward a political settlement with Kabul. Disgruntled commanders from the Haqqani Network and the Islamic Movement of Uzbekistan could choose to work under its umbrella. The Pakistani Taliban faction led by Maulvi Fazlullah (who comes from the Panjpiri sect, which is similar to Salafism) may choose to ally with IS, especially after his group’s attack on the Peshawar school was condemned by both the Afghan Taliban and al-Qaeda. Similarly, as Lashkar-e Taiba refrains from large-scale attacks on India, disaffected members of the Salafi jihadist group could fall into IS’s welcoming arms. And Sunni jihadist groups in Balochistan that target Pakistan and Iran may find common cause with IS. IS has a lot going against it in South Asia. The governments of neither Afghanistan or Pakistan are interested in giving it patronage. The region’s decades-old jihadist infrastructure is dominated by Sunnis from the Deobandi subsect who have a long partnership with al-Qaeda. And while sectarian violence has grown in Pakistan, and could become a factor in Afghanistan once again, it is not a primary social cleavage in either country, in contrast to Iraq and Syria. We may see major jihadist groups “bandwagon” with regional states against IS in South Asia. But their collective opposition to al-Baghdadi’s organization won’t preclude it from bringing more death and destruction to a region ravaged by conflict for decades. Arif Rafiq (@arifcrafiq) is president of Vizier Consulting, LLC, which provides strategic guidance on Middle East and South Asian political and security issues. What Happened to ISIS’s Afghanistan-Pakistan Province?Can ISIS Gain a Foothold in Balochistan?Islamic State Defections Fracture Pakistan TalibanThe Islamic State's Potential Recruits in PakistanWill Pakistan Part Ways With Its Proxies?